After tackling the desert heat of Dubai and the punishing environment of the Nürburgring Nordschleife, AMG – Team BLACK FALCON’s 2016 campaign moved to the mecca of motorsport, Italy’s Autodromo Nazionale Monza. 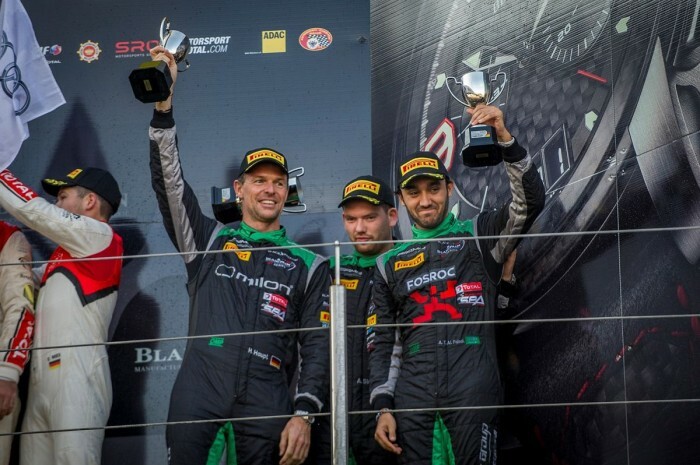 The opening round of the Blancpain GT Series Endurance Cup netted the team’s Mercedes-AMG GT3 a pair of solid sixth-place class finishes after a hard-fought three-hour race that was packed with incident. 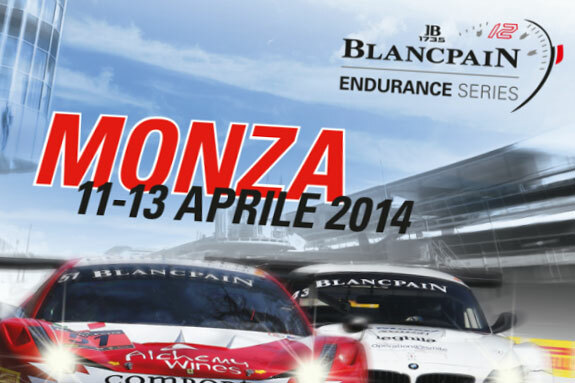 There couldn’t have been a more perfect venue to kick off the Endurance Cup: Monza is steeped in racing history, home to legendary F1 Grand Prix and 1000km sportscar races, and the venue holds a special place in the hearts of drivers and fans alike. 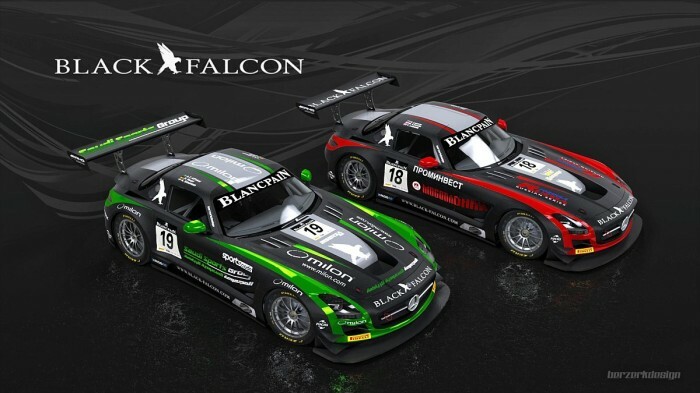 The series has attracted a capacity entry, and AMG – Team BLACK FALCON’s new-for-2016 Mercedes-AMG GT3 racers were part of a huge grid of 57 cars run by highly professional team and featuring the cream of the world’s sportscar drivers. With all cars of equal performance and running to the same GT3 specification but split across three classes divided by driver experience, the racing was always going to be fraught with challenges. Constant traffic was guaranteed from the off: around Monza it would mean one car for every 100m of track. Entered in the Pro-Am class, AMG – Team BLACK FALCON’s Mercedes-AMG GT3 #56 was driven by Oliver Morley (United Kingdom), Miguel Toril (Spain) and Maro Engel (Germany). In the Pro class for all-professional driver line-ups, the #57 crew comprised Hubert Haupt (Germany), Adam Christodoulou (United Kingdom) and Andreas Simonsen (Sweden). Qualifying showed just how tight the race would be: the top 31 cars were covered by just a single second around Monza’s near two-minute lap. AMG – Team BLACK FALCON #56 crew were less than half a second from the pole-winning time, qualifying 18th overall, with the #57 sister car just 0.013 of a second behind in 19th. When the lights turned green at the start of the race there was chaos as the huge pack blasted down the wide main straight towards the tight first chicane: cars scattered like a shotgun as they braked three and four wide. Many other cars cut the corner and gained time, but starting drivers Miguel (#56) and Hubert (#57) in the AMG – Team BLACK FALCON Mercedes managed to survive the first corner melee unscathed. Through the first hour both drivers ran in the top 20, staying in contact with the leading pack. #57 ran as high as 10th as the first pit-stops and driver changes approached. As the hour ticked by the pits were flooded with cars, some even forced to be jacked onto trolleys to extricate themselves from the tightly packed lines of cars. AMG – Team BLACK FALCON would suffer from the same crush later on. With so many cars diving in and and out of the pits it took a while for the order to shake out, but AMG – Team BLACK FALCON’s two Mercedes maintained their positions around the top 10. Oliver and Andreas took over the cars for the middle stints; unfortunately this is where the race turned for #56, as a pit-lane violation triggered a drive-through penalty for Oliver, losing the car around 10 places and dropping the car into the midfield. Andreas put in a stunning drive, gaining places lap after lap, and he stormed up to 7th at the final hour mark before diving into the pits to hand over #57 to Adam. His hard work was almost undone in the pits, as the race-leading McLaren boxed in the Mercedes, losing the team a couple of vital seconds as the team pulled back the car so he could clear the 650S. Adam fought back through the field, putting in a fantastic stint. He was involved in an epic battle with one of the big Bentleys for seventh, running nose to tail lap after lap as he looked for a way past. Finally on lap 77 Adam managed to get through, and focussed on the next target in sixth place. As the clock counted down, he relentlessly closed the gap: nine seconds became six became three and the Audi came into clear view of Adam. The chase was on with 10 minutes to go, and on the penultimate lap he found a way past, only to be hit and spun by a back-marker, losing the place he’d fought so hard to win. Slightly further back, Maro had also been reeling in the cars ahead and battled #56 back up the order. At the flag, #57 would claim a fine seventh overall, sixth in the Pro class, with #56 in 18th overall, sixth in Pro-Am. 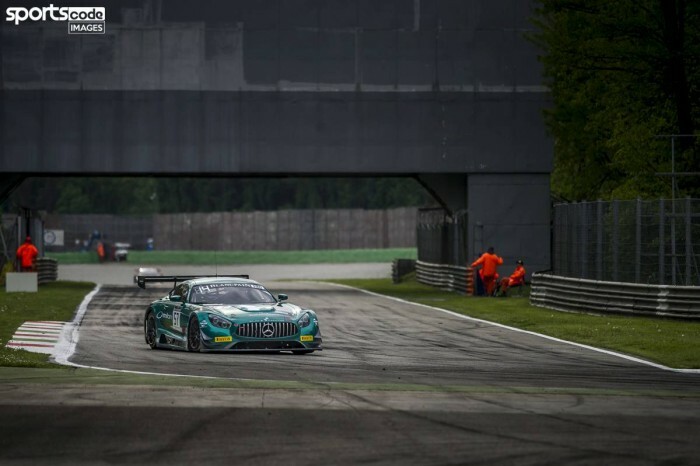 Monza was the scene of relentless battles for both AMG – Team BLACK FALCON Mercedes-AMG GT3s, and is indicative of how the year will run. Both driver line-ups performed strongly, and the team were happy to score the pair of sixth-place class results, gaining valuable points in the process. The team have just three weeks before the second event of the Blancpain GT Series Endurance Cup, to be held at the famous Silverstone circuit in the UK – and soon after that comes the epic challenge of the Nürburgring 24 Hours.